Are you looking to move into a strategic role in the near future or you would like to learn the latest trends, techniques in your field or you are starting some critical initiatives in your company and would like to know the best way to build policies or you are a knowledge maven who are looked upon for support by your peers and would like to stay ahead in your learning curve. The answer to all the above is earning a fellowship. 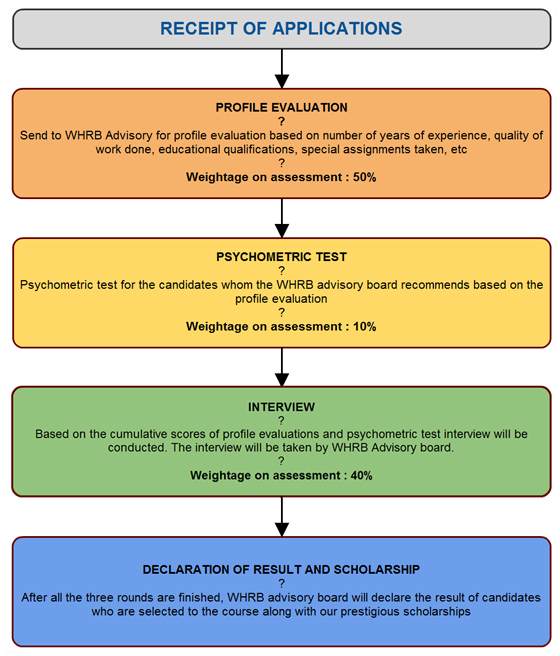 The WHRB Fellowship in Strategic HRM and OD - is where HRM, business knowledge, cutting edge skills in OD and academic excellence meet, producing one of the most exciting, challenging programs in the world to learn about HR application to business and Management. The HR curriculum is highly relevant with a HR content - rich learning environment. Fellowship gives you credibility which companies look for in their leaders. Fellowship gives you critical skill to lead a function. Fellowship gives you strategic tools & techniques in specific verticals. Fellowship helps you gain decision making skills to build strategic policies. Fellowship gives you a branding of a leader of your discipline. The Fellowship in Strategic HRM and OD is our flagship program. With only 5 scholarship seats per city , competition for places on this select program is fierce. Career Guidance – You can work with career mentors who help guide and coach you individually. Latest Trend Learning – Post program latest trend learning for 2 years through articles & latest trend videos. Job Notification Support – Get curated job alerts from our 17000+ HR alumni. Currently we get information of up-to 7 open positions in HRM every week. Most of these positions are linked to our certifications & long term programs. Network Yellow Page – You will have an opportunity to network with 100s of successful HRM leaders in over 40 countries who can help guide support in both learning & career growth. Networking - You will get an opportunity to be with a class of extraordinary participants having similar career aspirations. Personal Brand Development – Excellent opportunities to write for our award winning HR blog & present your ideas through HR videos to a global audience. Mentoring – Great opportunity to work as HR Innovation, HR Project & Career mentor for other individuals. Win awards & get recognized for your quality of ideation.